Boat bunks, fitting-out ideas for your wooden boat. All boat bunks need, primarily, to be comfortable. However, on every small boat space is a premium. The most common arrangement is the settee berth, which is used for seating during the day but converts into a bunk for sleeping. Boat builders are an inventive lot and over the centuries they have come up with innumerable ingenious sleeping arrangements. This is especially true of wooden boat owners. Much depends on the space available after all the other essentials, such as galleys, chart tables etc have been catered for. 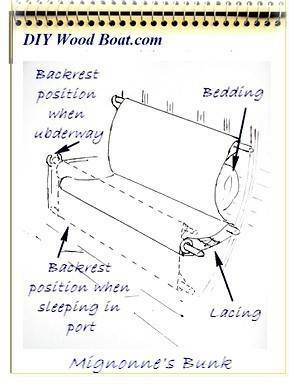 The settee or transom berth is the most common arrangement. So, some method of extending boat bunks for night time use is needed. The hinged backrest is an excellent idea where the space behind can be used, during the day to store the bedding. The backrest needs to be at and angle of about 10 degrees from the vertical to be comfortable during the day, yet be out of the way for comfort during the night. Various other methods have been used such as using in-fills to increase their width between settees. The fold away saloon table top can double up as part of the infill. On one of my previous boats had settees on either side of the saloon, the infill was made up of 12inch/305mm boards, these were easy to store and I often used just one as a 'coffee table'. 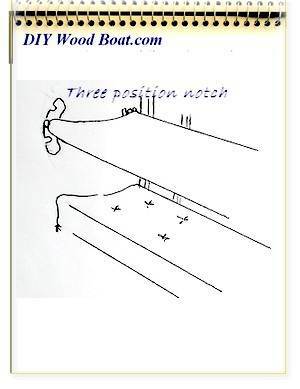 Another method is to have an extension which slides out from underneath. However, if you use the 'padded' backrest as an infill there is no need to find storage space for the extra 'mattress'. All that space under the settees makes for ideal storage space. This space can be accessed fro the front. However, as this will be quite a deep space, access will be easier from the top. And the openings can be made quite large, accessed from under the padding/mattress. However covers for the openings must be constructed securely so they don't give way under a large bottom or bouncing child (unless you deliberately want to get rid of them). And take care when using knotty Wood as framing timber. The Pilot berth or sea berth is usually a fixed affair which is only found on biggish boats. Quite often they end up being used as storage areas for bags and the like rather than boat bunks for sleeping on. The 'Quarter berth' is an excellent use of that 'tunnel' under the cockpit seats or aft side deck. Although some find them too claustrophobic for comfort, they can be snug, safe bunks for use at sea. The major down side of the quarter berth is often the lack of ventilation. The bottom end of that dark tunnel can become damp and smelly. A vent of some sort at the bottom end will help keep it smelling sweet however, this will need to be one which can be closed easily in foul weather, such as a mushroom vent. The basic pipe cot is regarded as a space saving utilitarian arrangements only fit for occasional use. However, they can be very comfortable boat bunks, especially when underway. And with a bit of imagination they can be designed to be converted into comfortable seating areas for daytime use. The usual arrangement is rather like a stretcher with a canvas base either sleeved or laced on to supporting poles. The 'temporary' arrangement I erected on Mignonne is still in use. Originally it was set up while I was rebuilding Mignonne so I could sleep on board. But I was then still at the stage where I wasn't ready to build something permanent. Neither did I want to spend money or time on upholstery which would most likely soon become grubby. It also needed to be convenient and easy to stow and erect and have somewhere to hide my bedding. Nor I didn't want to spend too much time building it. However it turned out to be so comfortable and convenient that the original contraption is still there. 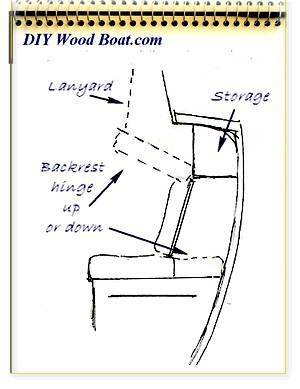 Lee-cloths and Safety Boards for Boat Bunks. The off watch crew trying to sleep on board, at night, at sea need something to prevent them from rolling off their boat bunks as the boat heels. Falling asleep on the leeward, downhill side is fine but if the helmsman changes tack you could be thrown across the cabin, not the nicest way to be woken up. The lee-cloth is probably the best solution to keeping you in your bunk. A good, stout, canvas cloth, well secured is much more comfortable than a board and easier to stow during the day. And the lee-cloth will do away with the need for any hard, wooden lip at the edge of the seating which will uncomfortably dig into the back of the sitter's knee. As a wooden boat owner you won't have the same degree of condensation and mildew as those poor relations, the plastic boat owners. However, damp and mildew are an ever present danger in any boat. 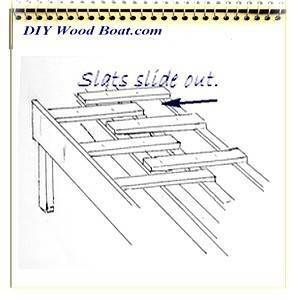 It is common practice to build boat bunks from plywood over a wooden frame work. While this is an excellent construction method the ply on the top of the bunk/settee needs to be pierces with ventilation holes to allow the upholstery to breathe. I've already mentioned the need for ventilation at the bottom end of quarter berths, fore peak berths can also suffer from poor air circulation. Mildew can be eradicated by a good spaying with vinegar however that is no substitute for good ventilation. The more air flowing through the boat at all times, whether through mushroom vents dorades or other means the better not just for your boat bunks but the boat as a whole.